Goooooood morning buttercup and welcome to the Christmas season!! I think we can officially say that now, right? Thanksgiving is done, the pumpkins are put away, and it’s full blown Christmas time. Bring on all the holiday baking, jingle bells, Christmas movies, cozy clothes and maybe even a little snow (but not too much because I hate being cold). 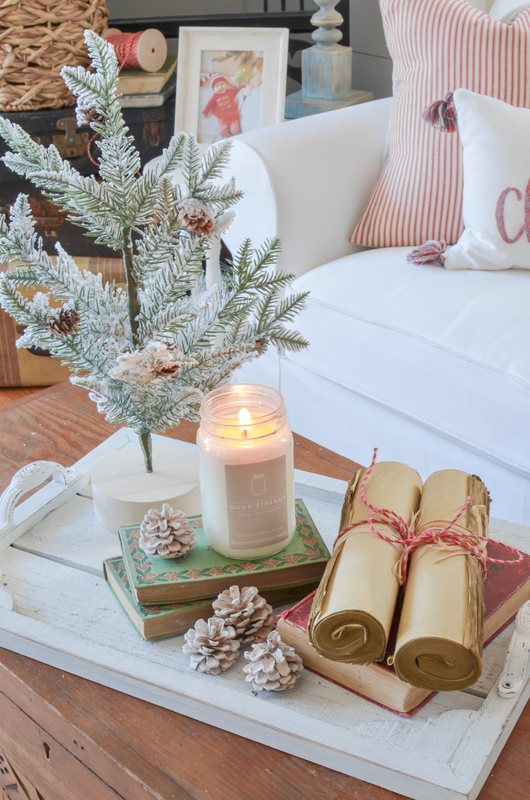 It’s officially the holiday season and it’s time to deck the halls! And that’s exactly what I’ve been up to this weekend. 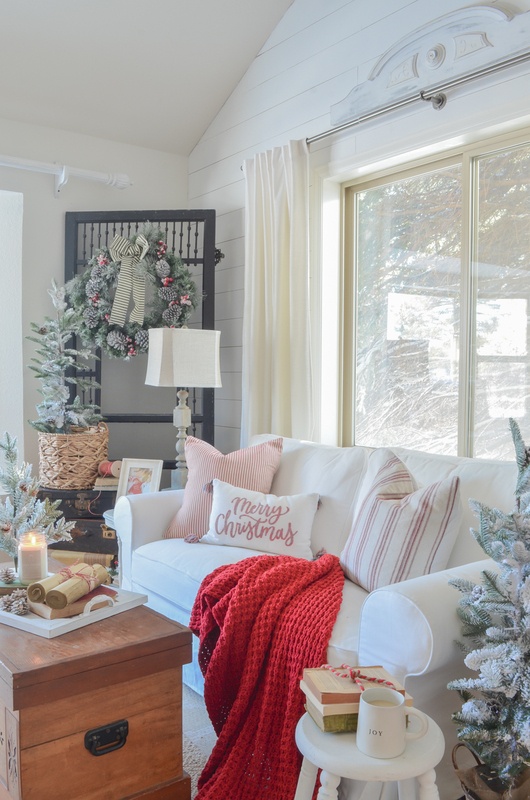 I decorated our front room for Christmas and I’m excited to share it with you guys today. As usual, I kept things simple and cozy. And I even used RED, which you know is pretty much unheard of around here! This year I finally got what I’ve wanted for a loooooooong time now now–a flocked Christmas tree! Isn’t she a beauty? It’s a little smaller than the tree we had last year, but I feel like it fits this room better and I love it so much. As usual I wanted to keep the tree pretty simple–I’m honestly not a big fan of ornaments so I tend to go pretty light with those. But I had to get my vintage wash basin out for the tree to sit in. 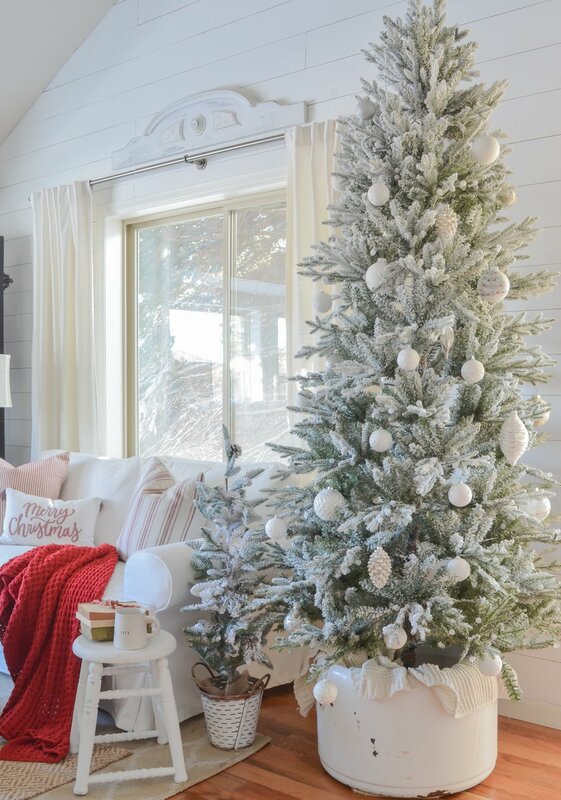 We’ve used this in years past and I love how it gives the tree a vintage vibe. We also always do a Christmas tree in our basement and that’s where I like to put all of our homemade ornaments–the kids and I decorate it together every year. I decided to leave my pile of antique suitcases over in this corner. 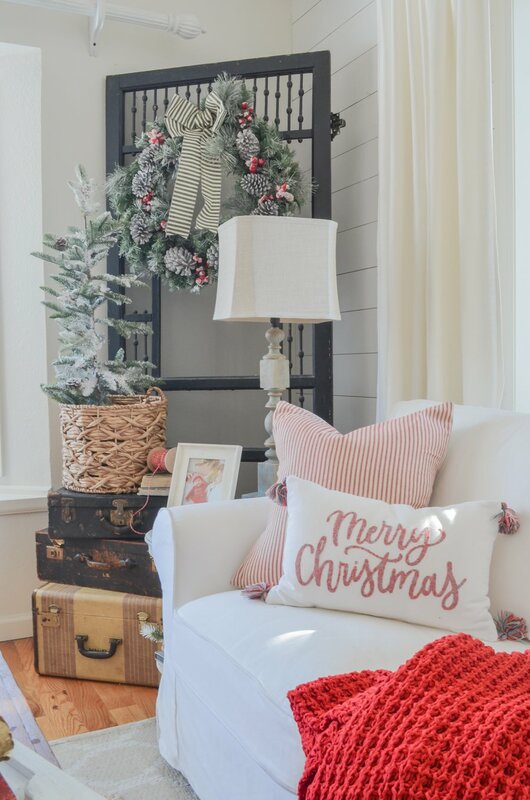 They were just too cute to take down, so I simply styled them with a small Christmas tree (from Michaels), a few old books, and a little red twine. Simple and easy. And that wreath on the old door is one I picked up a few years ago (from Home Depot). I opted for a very simple vignette on my old trunk. I used my beloved DIY tray, along with a few red and green vintage books. I actually just got that pair of little green books from my sweet aunt and I feel like they totally have a Christmas vibe. I used these red stripe pillows last year and they’re from With Lavender and Grace. 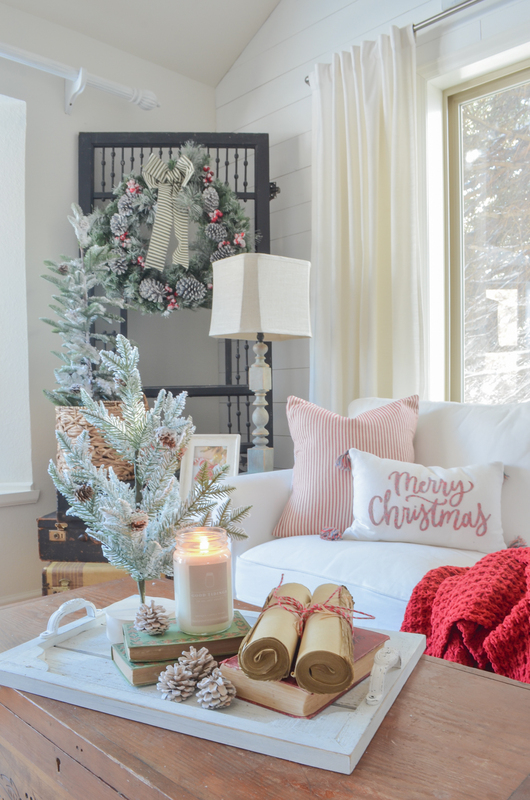 And that cute little Merry Christmas pillow is from Target. You probably noticed that I’m using a lot more red this Christmas. And you know what?! I LOVE IT. I’ve actually been really surprised by how much I love it, but it’s kind of fun to see more color in our home. Last Christmas I did a very neutral look and this year I’m just feeling a brighter look. It’s still pretty subtle, but a little red goes a long way, right? I love how this space came together this year and I think it’s so cozy. It’s actually the perfect spot to enjoy a cup of hot chocolate and a delicious baked good, which you better believe I’ve already done a few times. Calories don’t count during the Christmas season, right?! Right. Thank you sooooooo much for stopping by the blog today! I can’t tell you how much I appreciate when you spend part of you day here. It’s truly means the world to me. 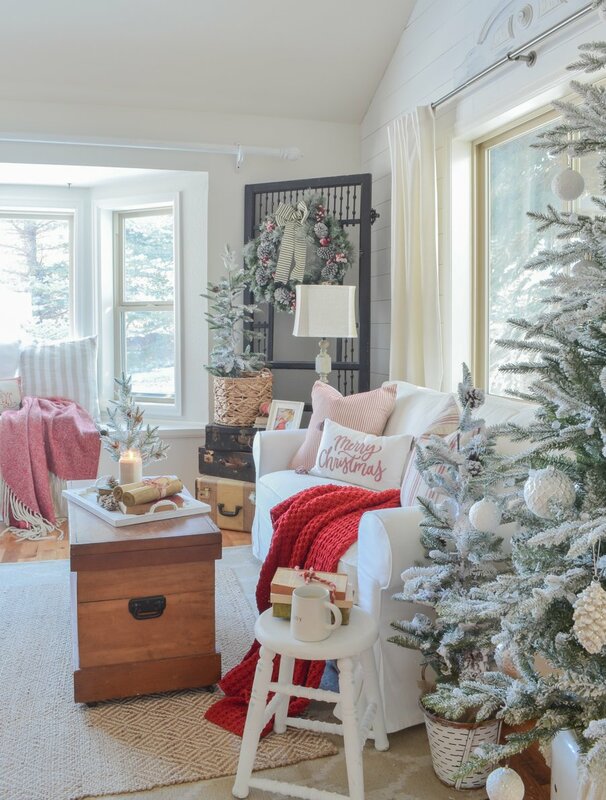 I love the little pops of red and the simple but cozy look to this room! I’m in full swing decorating mode too! It’s so much fun! Thanks for all of your ideas and inspiration! I’m excited to see more! Thanks Melissa, I’m loving the little pops of red too. Thanks for dropping by, I appreciate your kindness!! Yes, it does look pretty, but it looks awfully staged. Do you really live like that all the time? Of course I style it for these photos Eileen, but it doesn’t stay like this for long because we do live here. It’s actually a mess at the moment, but I doubt anyone would enjoy seeing photos of pillows thrown on the floor, a laundry basket in the middle of the room, and toys scattered around. Oh Eileen, such a stupid question. Really 😏 Here is one for you. Do you usually plan a photo shoot first thing after getting out of bed? Looking haggard, messy hair, pale unmade face, or do you try and look your best? Same goes for Sarah, or any blogger shooting photos of their lovely homes at Christmas or any other day, to inspire, encourage and put out their best. Pedal your snarkiness elsewhere. Good grief. As always it looks amazing, I get the best ideas from you as I have a very similar house as you know but with touches of coastal thrown in. I call it country coastal lolol. I love when I have rooms that I am finished decorating and or cleaning and it looks “staged” but nothing is better then a beautifully decorated room that is completely lived in. Makes it more cozy comfy. So pretty, Sarah! 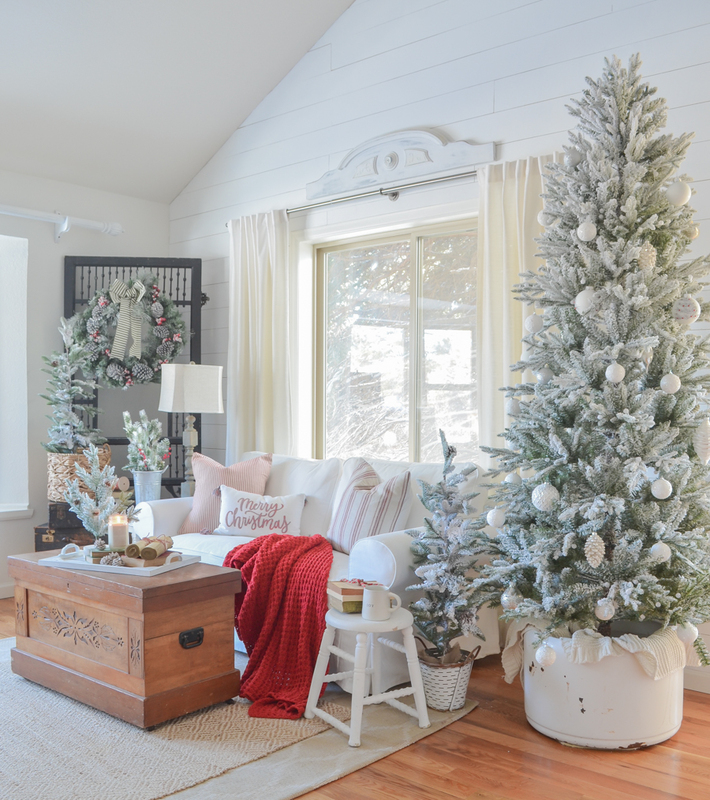 I love the simple touches of red, and the new flocked tree is beautiful! I love how much natural light you have in your home. Thanks for sharing! thank you Vicki!! And yes, we are so blessed with lots of windows in this house. I need that sunshine!! This is gorgeous!!! I LOVE the pops of red! What size pillows do you typically order from With Lavender and Grace? Thanks Heather! I believe all of the pillows I have are 20×20. I love this space!! 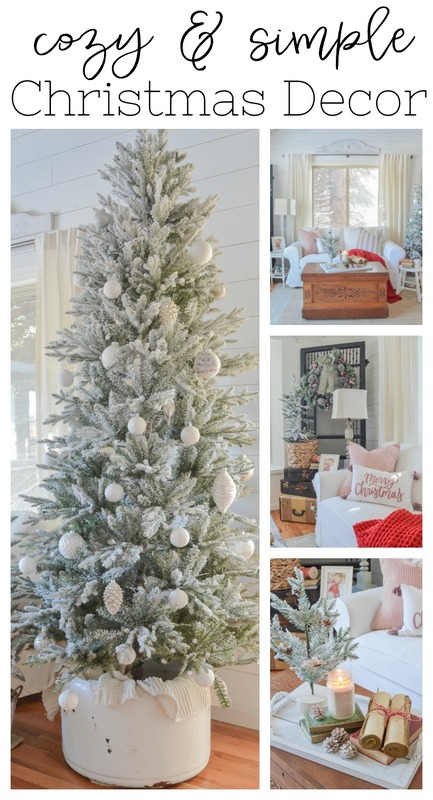 I love the flocked tree; I will definitely be adding one to my list of decor-yet-to-be-purchased! 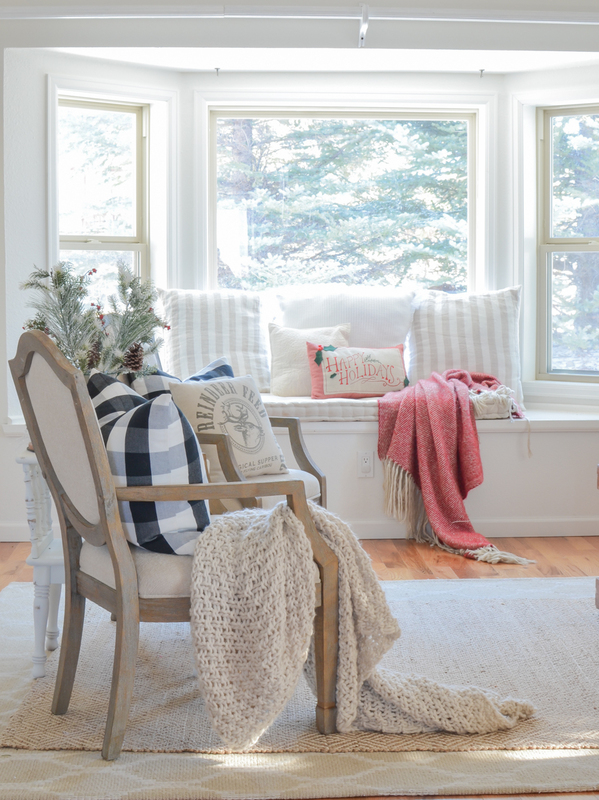 The pops of red really pull the whole space together – not just stark white everywhere. Love it! thank you so much Alyssa!! That tree is actually from Lowe’s! This turned out beautiful, Sarah! Love the red! 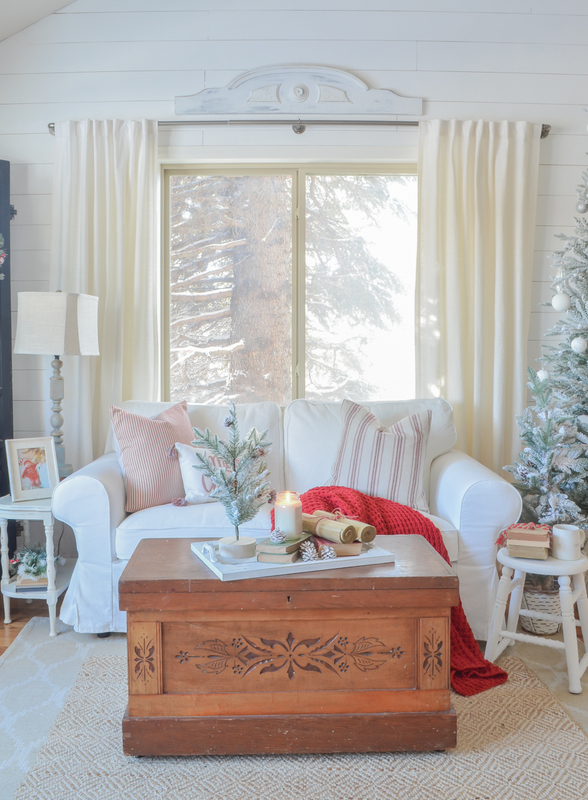 I love the way you decorate and have learned a lot from your blog could you please tell me where you purchased you little couch you have in your photos today? Thanks Sarah have a great day! Hi Roxanna, that little sofa is from Ikea!! I’m seeing the Ikea Ektorps a lot – are they comfy? I like a “sink into” kinda couch and just wondering if this fits the bill! Looks so cozy! They’re pretty comfortable. Not super plush, but not super firm either. I actually like them. And they’re really affordable, which is perfect for the season of life that we’re in with 3 kids. Thank you Angela!! I am so in love with this tree. It’s from Lowe’s actually! Sara, Love the flocking on your trees 🌲 I flock this year for the first time too. Love it. Is the brown rolls on your trunk paper bags roll up? That is a great idea. Thank you for sharing. Enjoy your blog. Those rolls are actually old book pages! I got those both at the Findery in Waco, Texas! I think you hit the nail right on the head. A LITTLE RED. I wanted to add red to my neutral decor, but I bought way too much. Now I don’t like it and I feel like taking everything down and starting over. Grrr. Oh no Pamela!! That’s not fun. But I’ve been there too. I had to really play with the red this year to get the amount I like. A little does go a long way! I love, love,love this! Red is my favorite color so to see some is great, especially at Christmas. I am so glad you did not paint your trunk. I love all the ways you decorate but I think this years Christmas decor is one of your very best attempts! Ah thank you so much!! I have to agree with you Nancy, I love this year’s Christmas decor much more than last year. The small pops of red bring the room to life!! Your front room looks beautiful as usual, Sarah! 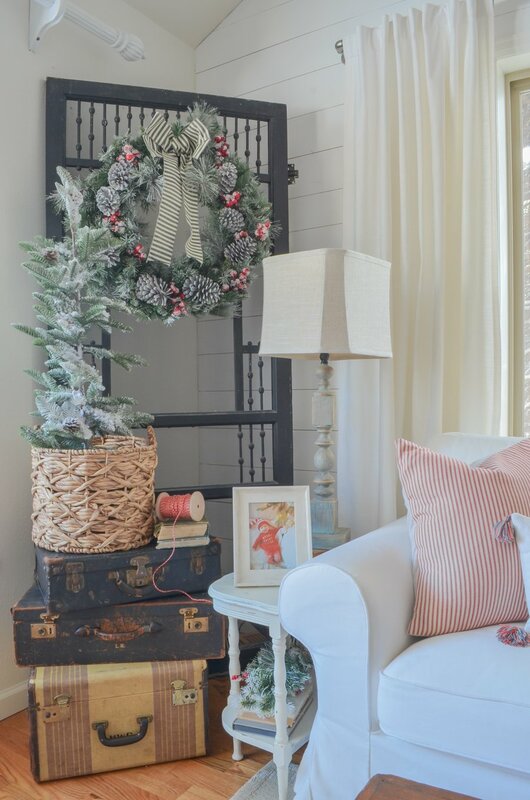 Love the unique touches you’ve added, like the white tub the tree is in, and the rolled up magazines tied with red twine. I’m not normally drawn to red either, but I’m using red touches this Christmas too. Thanks Kyla!! I love the red this year and that old white tub is one of my favorite finds ever!! ah thank you Sherri, I really appreciate that!! haha thank you so much Sherri!! The room is gorgeous. Love the red for a new pop for you. I always have something red in each room to make me smile! oh that’s awesome Sally, maybe I need to start doing that! I LOVE the basin your tree is in! Beyond perfect!!!! Nice job on the room. Also, loved that you pointed out in your Instagram stories that it doesn’t always look perfect. I know I’m guilty of comparing my home to the “perfect pictures,” so it is always a great reminder that it isn’t always so. Oh I love everything you do!!! Those little red n green books are dreamy!! 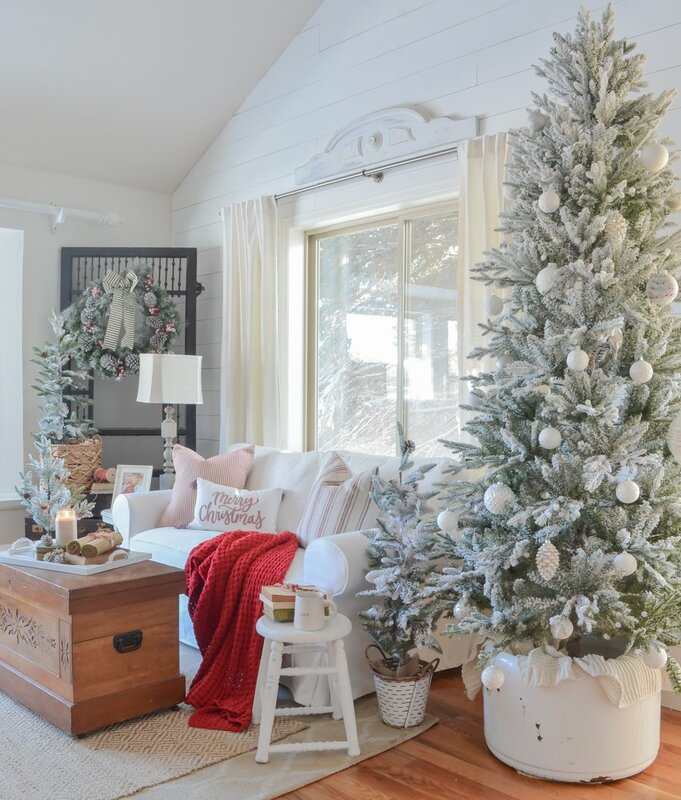 That flocked tree makes me smile!! Your decor is so warm and inviting. Isn’t that what home means??? Come in and stay for a while!!! Very beautiful!! The red is perfect, not to much, but enough that the whole room pops! Very cozy!. 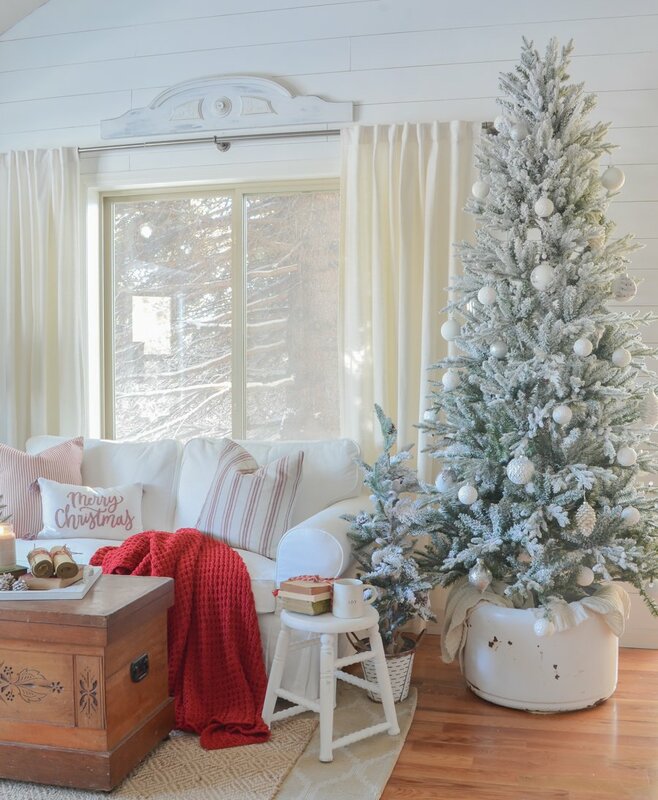 You have inspired me to make a few changes to my decorating for Christmas! Thank you! Thank you Cathy! A little red really does go a long way . Loved all your little touches of red. Your room has a very Christmas inviting look. Really like the wood piece hanging above your window. thanks Carol, I found that at an antique store!